Mortgage Rate at 4%.. Wow! Another huge night at the Palace! I take down the Maniac and folding pocket Aces. What a wild night of poker. The night started out slow with only 4 players and the all the hosts playing. Sheldon proceeded to chase his draws and doubled up a few players. Since the action was slow the table agreed to play a round of Hold'em and a round of Omaha. I was pretty card dead and had not played a hand in the first hour and was happy for a change of pace. I should have quit right there. It was only 2hrs into the game and I was up over $400 in front of me and the chip stack leader. I proceeded to quickly give all of it back. Sheldon cracked my set of Aces in Omaha when he hit his open ender on the turn. The board didn't pair and I had to pay his short stack off. This got me back to $200 and I am not sure where it all went. I finally busted out in Omaha when I chased a Queen high flush and hit, only to lose to an Ace high flush. I decided to use the house credit for $200, this was the first time for me. The game started getting more action players and I knew if I played long enough I would win it back and then some. I was pretty card dead for a while, but was patient and the hands came. 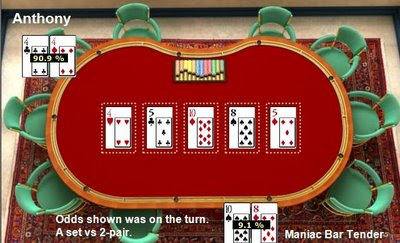 Quad Jacks: We were playing Omaha and I had pocket jacks and 2 rags. There was a $10 pre-flop raised and I called with 5 other players. The flop is 10 10 Q. Everyone proceeds to check around, including myself. The turn is a Jack! I just boated. The pre-flop raiser bets the pot and basically pushes himself all-in. I push all-in and he calls for his remaining chips. The River is another Jack and he shows Q10. He flopped a boat, slowed played it and lost.. Lesson here is to never slow play in Omaha! Aces vs Aces: My hand of the night was also in Omaha. I have pocket Aces and a suited King with a rag. I pot it pre-flop and get re-potted by another player. A third player decides to push all his chips in for around $180. I push all in for my remaining ~$200 and the guy that re-potted me calls. The pot is around $640 all pre-flop! The flop is 845 with 2 spades. I have AK in spades. I show my hand. The turn and river are 2 Kings. Everyone checks their hands and one guy mucks and the other guy who re-potted me is frustrated. He also had pocket Aces, but no redraw.. The $640 pot is pushed to me... One guy comments that he had pocket fives... Good thing I raised. Now, I am up over $400. I can pay back my marker and take home a nice profit. I played a few more rounds of Hold'em. I started getting some cards, Jacks and Kings. Most everyone folded on the flop to my continuation bet. I left shortly after a 7 hour session for a profit of $233 for the night. This month has truly been record setting. The best month since last April and it marks 8 straight months of winning. I have received annual noticed that my Mortgage rate on one of my houses in Michigan is about to adjust on April 1st. The new rate will be 4% down from 6% the prior year. Dam!!! I purchased his house over 10 years ago and got an adjustable rate mortgage. Some might cause me crazy but it has adjusted ever year from as high as 9% to now a low of 4%.. It basically adjusts with the economy or more specifically the 1-year treasure bill. March is starting out very solid for Poker. I spend the first week of March at my home town in Flint, Michigan.. I played at my normal place and broke the $1000 mark in the first week. Last night, I was back in Austin and played at my normal Friday night game. I should have quit after an hour of playing. I was really tired and after a long day in Dallas for work.. I hit a set of nines and took out pocket kings and AQ after the flop was Q94. The pocket kings was all-in with only $45 left. The AQ guy called $45 and I pushed all-in $150. Surprisingly, the AQ guy folded to my re-raise, "Good lay down!..." This pushed my stack to a little over $300 and I was only 1 hour into the game. I proceeded to donk off most the the winnings I got down to $150. Then, I chased a nut flushed and hit on the river. A guy in front of me pushed all-in, into my nuts. I called and was back up over $300. I decided to quit a few minutes later for a net profit of $100 for the night. 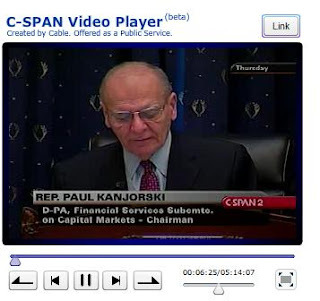 Watch this video on C-SPAN.. It is Congressional hearing on Mark-to-Market accounting rule. The real reason behind the current financial crisis. After watching this I feel good that Congress will act. They told the chairman of the Financial Accounting Standards Board, FASB, that they should relax the rules on "Fair Value" or Congress will. The chairman of FASB, said that he would issue more guidelines within 3 weeks. It was a heated debate and Congress on both sides were unified in there opinion that Fair Value accounting or Mark-to-Market accounting needed to be altered in some matter during this crisis. Finally we are moving to the root cause of the issue. It took them some time to get it, but we should all feel good about our future now. I just return back to my hotel after another huge night at Palace Poker, in Flint Michigan. I turn a set of Aces while another guy had 2 pair and a third guy had a pair and a flush draw. The pot was over $850 and both players had me covered. I had about $275 in front of me at the time and more then tripled up! I ended up cashing $872 for the night after a buy-in of $200. It was one of my best night ever. As I look back at my stats, I did well here exactly one year ago also! It was nice that my Aces finally held up. I did have Aces earlier in the night, but no one called. I had to fold pocket Aces last Sunday after two tens flopped with 7 pre-flop callers. 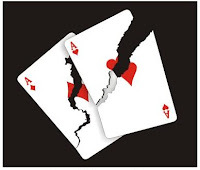 The time before that, my Aces were cracked when a guy hit his set of Kings on the flop to crack my Aces. I am back from another nice session of Poker at my favorite place in Michigan. I cashed out $670 after buying in for $200. I was patience and took down a Maniac bar tender after waiting for 6hrs. I flopped a set of fours and rivered a boat. He turned top two pair and was behind all the way. Like most bad players, he cant fold 2 pair and paid me off after I over bet the river. What really amazes me is how most people can't fold 2-pair. Most of my double ups is when someone hits 2-pair or top pair with top kicker and I have a set or better. I think this is what makes me successful. My standard for calling a big bet is bigger then most people. 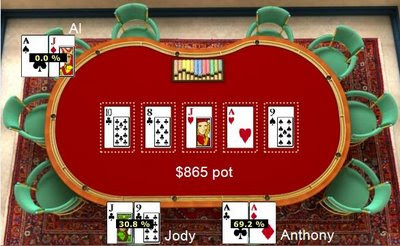 Most people just play their hand and if it is top 2 pair, they are not folding, even if the board shows a potential straight, 3 of a kind and full-house. The flop comes 10 10 4. I am first to act and check my pocket Aces. The straddler bets out $10, a couple of folds and another guy re-raises to $20. I figure one of them has a ten, but the pot is $86 and it only costs me $20 to see another card. So I smooth call the $20. The original better re-rasies to $50 and the other rasier pushes all in. I am forced to fold and show my neighbor my pocket Aces. The other guy calls. The straddler had J 10 and the other guy had A 10. The turn is a Jack and the straddler fills up and takes it down.. sick... The worst hand won... To bad their wasnt an Ace on the turn or river. That would have been evern sicker.. The "rounders hand"..